Bangalore: A year ago, Taj West End was the place to go in Bangalore for wine connoisseurs. It stocked 250 wines, many from France, Chile, Australia, New Zealand and California. It still remains the place to go, but now stocks around 210-220 wines. The reason: high tariffs and slowing demand in the wake of an economic slowdown. India’s small wine market is becoming smaller, and importers and hoteliers are shrinking their wine lists even as they battle with excess inventory. “Companies kept on importing labels, thinking the market would grow," says Abhay Kewadkar, business head (wines), and chief wine maker and director at United Spirits Ltd (USL), part of the country’s largest liquor company UB Group. “(But) states kept increasing duties." Much like imported hard liquor, wines are taxed by both the Union government and the states. Over the past year, Maharashtra, Karnataka and Delhi, the three biggest markets for wine, hiked tariffs by 37%, Rs300 per litre and 30%, respectively. The result: higher prices and lower demand. Meanwhile, the global economic crisis meant fewer business travellers and tourists for India and, consequently, lower occupancy for hotels. Indian companies, too, responded to the slowdown by asking executives to trim their entertainment expenses. As demand for wine fell, the hotels responded by stocking fewer labels. According to Aman Sharma, manager (corporate food and beverages) at Indian Hotels Co. Ltd, which owns the Taj group of hotels, the wine lists at the Taj properties shrunk by 10-15% over the past year. The company has restarted purchases of imported wines, he adds, but the quantities are still down 10-15%. Wine importers have also reduced the volume and variety of their imports. United Vintners, a subsidiary of USL, which imports as many as 35 labels or wine types, plans to control the import and sale of expensive wines such as Marlborough, grown on the east coast of New Zealand, and Chablis and Burgundy, grown in eastern France. “The more volume you try to do, the more money will be stuck," says Kewadkar. The company, promoted by Vijay Mallya, entered the wine business in October 2008 and hopes to account at least 1% of its parent’s revenue by March 2010. USL ended 2008-09 with Rs4,152 crore in revenue. Mumbai-based wine importer, Berkmann Wines Cellars (India) Pvt. Ltd, too, says it plans to prune its wine labels from 250 to 150 by March. The company ended 2008-09 with Rs5.2 crore in revenue, substantially off its target of Rs7 crore. “Earlier we would bring five companies from a particular (wine growing) region, now we bring only two-three," says Farhad Bhabha, commercial director at Berkmann Wines. Not all wine importers will survive, said Gryphon Brands’ Chandra. Sure enough, saddled with inventory, some are selling imported wines at discounted rates to hotels. “We are trying to deplete stocks by selling at discounted rates," says Jaidev Chatterjee, general manager at Mumbai-based liquor importer Sonarys Co-brands Pvt. Ltd. “Bangalore over the last one year has become unviable." His reference is to the Rs300 per litre tax the Karnataka government has imposed on wines manufactured outside the state. Still, not everyone is convinced this is the end of the road for wines in India. Despite the small size of the market, high tariff structures, and uninitiated customers, Australian wine maker Casella Wines Pty Ltd, which makes the Yellow Tail brand of wines, believes being in India is worth it. “Choosing to be present in India today is an investment in the future," said Richard Owen, Asia-Pacific export manager at Casella Wines, in an email. According to Owen, the current size of the Indian market in no way reflects its potential. Demand, he said, would increase “once individual states charge more reasonable and realistic taxes and allow imported wines to compete more fairly with domestic wines". USL, too, believes wine is a business of the future. Around the world, 1.1 litres of wine is consumed for every litre of hard liquor. The Indian average is 0.0075 litre for every litre of hard liquor. 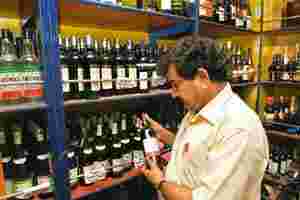 “The Indian wine market can grow to 200 million cases on par with IMFL (Indian made foreign liquor)," says Kewadkar.